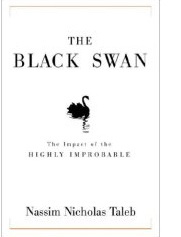 I'm loving The Black Swan by Nassim Nicholas Taleb! Really well written non-fiction. Somehow Mr. Taleb has made a complex non-fiction book into a page turner. This is a masterful book about how surprises can change everthing and how we understand the workings of our daily lives and the world much less than we think we do. This delusion of certainty and knowledge can cause us regularly to make bad decisions in our lives. The whole housing and credit crunch mess is a perfect example. Taleb argues that in simpler times things were more predictable and linear but now we live in a world where winner takes all or close to it. This is a complex argument and I'm not doing it justice. Besides being a blogger with ambition albeit not a lot of time to invest, I'm also a software developer another occupation where The Black Swan holds sway. A few will strike it rich with a software hit and the rest will labor in obscurity with dissappointing results. You don’t know whether you will get lucky one day and reach a tipping point that sweeps you into the bigtime. And even if you do get a hit, will you be a one-hit wonder? it seems a little like playing the lottery at the moment. Please take a look at this book in your local bookstore and see if you don’t get drawn in. Taleb is a quant trader who got fascinated by the unexpected and then went into a field where uncertainty reigns supreme. Then he started writing books about it. The Black Swan is currently 34 on the New York Times Bestseller list. I pre-ordered iPhone: The Missing Manual and it came in yesterday. The price is a reasonable $13.59 on Amazon. I've read the first 70 pages so far and expect to read it cover to cover in the next couple of days. It's better than I expected. The pages are well-designed and the paper is decent quality unlike many of the tech books that come out these days. David Pogue liberally sprinkles color screenshots throughout its 292 pages (they are gorgeous because the iPhone screens look so good). I'm guessing that O'Reilly's Pogue Press figure they will sell a lot of these so they could afford to make it a pleasure to use. Pogue and his team do more than merely regurgitate what is in the free downloadable iPhone User Manual available from the Apple site. You get (1) a more objective description of the iPhone and its capabilities and (2) extra commentary, web links and recommendations. This PDF covers the basics well, but it's largely free of details, hacks, workarounds, tutorials, humor, and any acknowledgement of the iPhone's flaws. This is a sturdy trade paperback book 5-1/2 by 8-1/2. About a 1/2" thick. I decided to buy it after talking to a colleague who loved the pdf version. I'm glad I did. Unfortunately you can't peruse the book's contents on Amazon. You should be able to find it at your local bookstore, though. You are promised to receive updated information on the associated Missing Manual website. I tried looking for it and it wasn't there yet. I printed out the iPhone User Manual pdf. And read about half of it in the first day. This book is more manageable to deal with than a bunch of loose pages or a pdf on the computer screen. And better as I explained above. I found that although I knew much of the content from daily use, I found reminders of features I had discovered earlier but then quickly forgotten. This is one of the better Missing Manuals that I've read and I've read quite a few. Since you paid $500 - 600 for the iPhone, it is probably worth your while to spend another $14 to master it even though you can certainly get lots of value without cracking the manual or this book. This new book about the iPod by a favorite tech writer, Steven Levy, is a great read. I've previously read and adored Steven's Hackers in 1984. Much later, I liked his book about Macintosh, Insanely Great. I regularly take pleasure in reading Levy's The Technologist column in Newsweek. The new book is entitled The Perfect Thing: How the iPod Shuffles Culture, Commerce and Coolness. I love it. It is packed with stories and insider information that only a long-time, highly-respected technology journalist could provide. Steven knows his subject well and was able to dig up all sorts of fresh and interesting stories about the iPod. We get to learn exactly how and by whom the iPod was created. Hint, it wasn't just Jonathan Ive. He was a key player for sure, but lots of other talented people were involved before Jony came in to make the iPod the extraordinary product it was on launch day in 2001. We hear from key players in their own words. That's only one chapter that I especially enjoyed, but there are many more interesting subjects like the Pod People phenomenon which Levy links to its origins in portable cocooning with the walkman. I found Levy's in depth discussion of cool really well done. 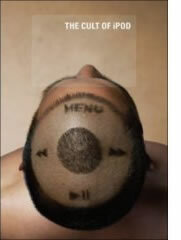 You've heard little smatterings about cool, and the iPod phenomenon over and over in the press. But, here you get taken deeper into these subjects by a really good writer. For me, this is a page-turner. Honestly. I bought the book last night and I'm 121 pages into it's 284 pages already. 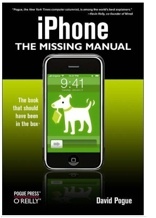 If you are a Mac and iPod fan, make sure to check out this book. Apple is selling the book for $25.99 even though the list price is $25. I got it at Borders for $20 with my Rewards card. I would normally wait and buy at Amazon where it is selling for $16.50 but I started reading in the store and couldn't put it down. A nice warm up for this book might be Steven Levy's interview with Steve Jobs at Newsweek Online. If you are anything like me, you'll want to read it. I should warn you that my iPod technolust was markedly increased by reading this book. The just released [project] red 8 gig Nano and the 80 gig iPod 5G are both tugging at me right now. It's a good thing I already have a wonderful 30 gig black iPod 5G in an amazing red and black Vaja leather case already. That gorgeous, expensive leather is the one thing standing between me and those new iPods. I think I will fall over the edge if Apple releases a [red] 5G iPod though (and there's a rumor...). If you've had a love affair with Mac and the iPod, you will find all the reasons why in this book. I've owned all 5 generations of the iPod. I'm a heavy-user, you could say. This book helped me understand my experience - my passionate fascination - better than any other iPod book to date. I discovered Dan Price Saturday. It was beautiful day. I drove over to Stinson Beach to give my new car some exercise. I found this intimate little bookstore with tons of character - Stinson Beach Books. By their very nature, beach town bookstores are special places, so I had to go in. 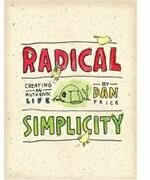 Exploring, I found this little book called Radical Simplicity: Creating an Authentic Life. The cover got my attention but the inside pages were even better. It is chock full of Dan's wonderful original sketches with mostly hand-lettering. Beautiful book. I started reading Radical Simplicity at the Sand Dollar Restaurant across the street from the bookstore. The burger I had there was scrumptious by the way. I read a good chunk of the book that afternoon and evening and finished it the next day. I was fascinated. The writing and sketching are excellent but the most interesting thing is Dan and what he thinks and does. He is a passionate and quirky guy. He seems naturally compelled to do things way off and away from the norm. One thing he seriously wondered about was what it would be like to be an indian in the days when indians lived peacefully and in harmony with nature. Dan's story made me wonder about indians too. Maybe I felt a little like Dan a long time ago when I first realized how modern industrialized civilization has really trashed the planet in a mere 100 years or so. And used up most of the fossil fuels too. It bothered me a lot then. I couldn't understand it. Eventually I kind of hardened myself to it and decided it was *just the way things are* and I might as well enjoy the good parts of the trend. So I became a technology enthusiast. I still recycled and stuff like that but stayed far away from being an environmentalist. Even still, I read Ecotopia when it came out and really liked it. Maybe it is the shadow side of my mind. Yeah. So Dan Price and his books worked on that side of my mind. And now I'm compelled to read everything the guy has written. Maybe not everything. Unlike most of us, Dan Price has made some very tough choices to pursue his unique vision and live life the way he imagines it should be lived. He's definitely advocating living lightly on the land. Dan has been on a quest. He's done a lot of traveling and a lot of building tiny alternative homes. He's lived in two tee-pees, lots of high-tech tents and some other little shelters that are perhaps best described as hobbit houses. Dan's written two other books that I'm currently reading: How to Make a Journal of Your Life and Moonlight Chronicles. They are different and were written in 2000 and 2001 while Radical Simplicity was written in 2005. I like the most recent book best and the Moonlight Chronicles second best and How to Make a Journal third. He's getting better as he goes along. I hope this trend continues. Dan also has written a series of zines over the years. Over 50 of them. He sells them on his website for $5 each. I'm very tempted to order a few. I'm sure I will. I'll get back to you about them once I've checked 'em out. Dan is not a god or a guru. But, he's very honest and has taken an alternate path from mine. And I admire him for it. I am curious to see more of the details of that alternate life that I've so far passed by. The full title is Leaving a Trace: On Keeping a Journal. I got this book on the recommendation of Mike Swickey who authors the paper notes in a digital world blog. His comment was “Best book in years on journal keeping.” Given my recent fling with Moleskines, it appealed to me. He was right. I'm really enjoying reading the book. Its required reading for anyone who wants vibrant access to the rich and meaningful world of journaling. The author, Alexandra Johnson is a writer and a good one. One thing that draws me in is her great curiosity and fascination with the journals she collected as she researched the book. She brings the mystery and treasure hunt alive. I remember as a teenager reading Nancy Drew. I loved the parts where she would be up in an attic poking around for clues or something special. This book is chock full of stories and excerpts from journals. A great read if you want to learn more about this sort of thing. The extra added feature is that the book inevitably motivates me. Motivation is key here. And all the examples provide options and angles when facing that blank page. If you've ever thought of yourself as a Renaissance person or just someone with a lot of passionate interests, check out this new book. Margaret Lobenstine is a passionate advocate and wise advisor for the Renaissance Souls among us. I'm definitely on the list and it's interesting and uplifting to see Ms. Lobenstine explain why Renaissance Souls are often better off following their multifarious instincts than choosing one area of interest and sticking to it. The people who are most secure are not those who pick one career and stick with it. They are the people who follow their passion–or passions. It's much more interesting than that, though. Lobenstine analyzes the vast changes that have been occurring in corporate hiring and organization and makes a good case for why the wise jack-of-all-trades may do better than those with a more single-minded bent. All those extra experiences, contacts, skills and knowledge bits can come in handy when tables turn in these uncertain times. When they found themselves unexpectedly cast out by economic forces, they were unable to compete for scarce jobs with those whose enthusiasm led to glow-in-the-dark recommendations. Lobenstine is a Renaissance soul herself and she's done very well. If you have worried that your lack of single-minded focus has or may be a career liability, you can load up here on a boatload of stories of how current and historical figures and Lobenstine's clients have done very well for themselves. Passion makes your performance sparkle, giving you an edge over "lifers." An ability to embrace change is valued within today's corporate world and the new "free agent nation." You're more likely to be a successful entrepreneur when you thrive on wearing many hats. Love of variety makes you a great project manager and troubleshooter. People who enjoy learning new languages and exploring many cultures are highly valued in the global economy. iPod, Therefore I am: A personal Journey Through Music is a great read. But, I'm not average when it comes to music. I've been a long-time music fan. I've read a ton about the roots of rock. How one group influenced another. I bought the Rio 500 mp3 player and a Rio MP3 CD player before I bought the first iPod and then the 10gb, the 20gb, the 15gb, the shuffle, the 60gb and now the nano. That's a lot, but I would sell or give the one's I abandoned as gifts. It all worked out. I had my music collection burned to mp3 way ahead of the vast majority of people. I like Dylan Jones' book because he takes this whole music-loving, obsession seriously and with self-deprecating humor. And makes some great observations about it all. Jones is a very good pop writer. I was reading the book last night and, to me, it was a page-turner. I didn't want to stop reading because he had me hooked. If you are really into music and feel that the iPod and iTunes have been a significant aid to your hobby, you'll love this book. If you are more casual about music, the hardback or paperback versions would make great inexpensive gifts for your iPod-loving friends. It took me about 2 hours to pick out 10 articles I wanted. Once I got past about 5, I figured I might as well use it up the whole quota. I wasn't confident that I would get back here and use up the last 5 within my 30 day limit. I'm not an NYT regular yet. All my articles were about China. I think I pretty well cleaned out the articles of interest since January of 2003. SARs was taking up a lot of ink in 2003, so that limited the output of other more interesting articles on China. Shanghai Journal; Splendid Skyline. Do You Feel Something Sinking? Shanghai Journal; All Aboard! But Don't Relax. Your Trip Is Already Over. Beijing Journal; Why Is That Woman Reading Aloud in Heavy Traffic? So I spent $15.95 on this nice little mix of short articles. Was it worth it? Maybe. I have to say that Ted C. Fishman's book, China, Inc. beats the heck out of them for sheer quantity and depth of information and I spent about a dollar more on it. The writing is possibly better in the short articles, but Fishman is a good writer too - he's written for NYT, Harper's, Time and Esquire. The Amazon price on the new hardback is $17 bucks. In this case the book won. Other times, especially with time critical information, the articles might win. But, Amazon wins by a mile in user experience. I found that it was pretty slow going searching through the NYT archives to find the best stuff. I couldn't force it to give me two separate words like China + lifestyles unless I put them together as a phrase which was too limiting. Using the two words without quotes gave me all sorts of lifestyles information about other places besides China. I felt a little like I was slogging through sand. It wasn't the snappy experience that might have had me going back right away. This is one of those cases where an improved shopping and buying experience would lead to lots more sales. Another thing I wanted to mention is that I really like the New York Times, but I don't want the huge amounts of paper I would get if I subscribed to the paper version. And I'm not big on ink either. About halfway through, I decided to Google to see what kind of information I could get. The results weren't very satisfying. I got little teaser articles or short blurbs. Then I tried the Newsweek website to see what they had on China, thinking a weekly magazine could go into more depth. They did. I found only one article of interest, but it was almost 4000 words. They charge $2.95 for a single article - a better price than NYT. The article I bought individually was called Does the Future Belong to China? It was worth the $2.95 I would say. This was a big overview kind of piece. Not as many interesting little stories, but well done and recommended if you haven't seen it and want to better understand China. Part 1. I love a good book. The new Sean Penn: His Life and Times is fine. Probably the biggest secret to its excellence is the interesting circle of friends that Sean has created for himself over the years. The second key feature is the format. It is made up of excerpts from Sean, his mother, his father and his friends. The author inserts brief connecting/background content here and there to glue it all together. The excerpts feel like a conversation but I suspect the author skillfully created that effect by the questions he asked and the editing he does. Here we have a movie star who is a great actor who impresses most with his integrity. And has succeeded on his own terms. 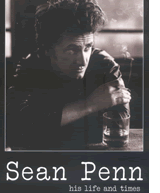 Sean Penn fascinates. Making movies is the dream job of our time: the pinnacle of fun and meaningful work. You want to know how he came to do this. If you don't like him, of course, perhaps you don't want to know. I read a lot of non-fiction and really like biographies. A good biography occupies a middle ground between the INFORMATION strengths of non-fiction and the STORY strengths of fiction. Check out this excerpt to get a feel.